I went to the Southern California Renaissance Pleasure Faire over the weekend. You can bet I'll be sharing photos (especially of my food conquests) and a report soon, but for now I have to share a tale of Star Wars and the renfaire. I always make it a point to see MooNiE when I go to the faire. He's a comedian, juggler, tight-rope walker, and many other things - some of which shouldn't be mentioned in public. As the show was about to begin, MooNiE looked to the back of the benches to see if people were still coming in. He spotted Boba Fett and Jango Fett. It's not so surprising. Boba, Stormtroopers or Klingons always show up at renaissance faires. He said hey and sent the bounty hunters on their way. But. It reminded him of a story. The SoCal faire has a sister faire in Northern California that is a little bit younger - the Renaissance Pleasure Faire of Northern California. It's old location was reasonably close to where George Lucas was working. 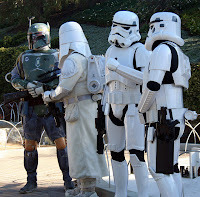 MooNiE said in 1577, right after Star Wars opened (because it was the renaissance time, you see), Lucas walked into the NorCal faire with a legion of Stormtroopers. He didn't say a word, just marched the troopers through the faire and left. This is, of course, just a story and I couldn't verify it. But come on, if this guy told you a story, you'd totally believe it, right? I do, and it makes me happy that Star Wars seems to follow me everywhere. If anyone has heard this before, let me know! Bonus points if you have photos. we go to see ye olde Captain America there as well. My mum was one of the folks working the Ren faires back in those days, I asked her and she informed me that it did indeed happen, much to the delight of everyone. wow, I thought I was just going crazy seeing storm-troopers everywhere...but they really are everywhere...hmm next evolution of the ninja maybe? @Generalsteam - I'm so happy to hear it, too darn funny. @Kova - They are taking over. Them and the slave Leias. The Angel Yearbook: Look ma, I'm a Demon! Kessel Run Diaries: How Will The Clone Wars End? Los Angeles Free Comic Book Day Events!